Is it Woodworking? Or Carpentry? At Saint John’s, Woodworking and Carpentry are two independent departments working out of separate shops. 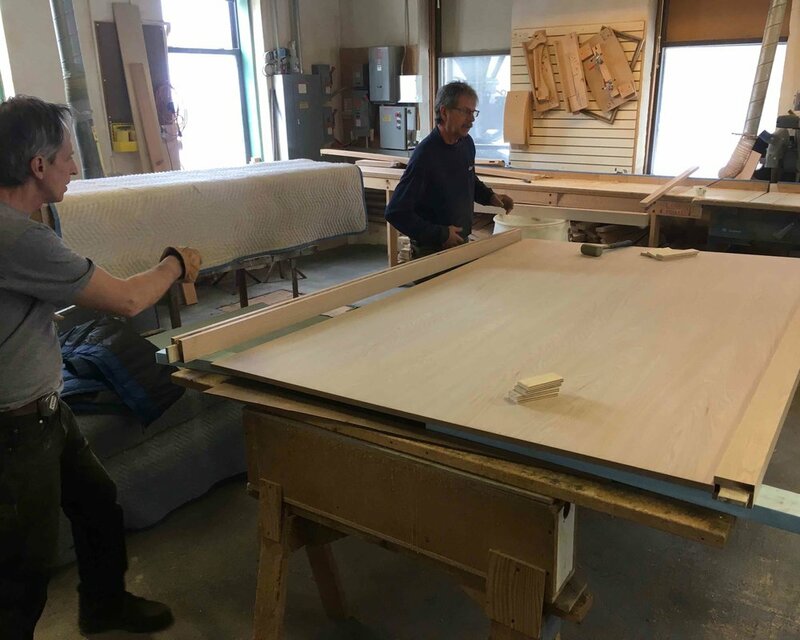 While the woodworkers craft furniture for campus in the Woodshop, the carpenters typically work on-site constructing frames, pouring concrete, installing fixtures, and making any host of repairs. However, there is the occasional project that blurs the lines between woodworking and carpentry. The Music Wall was such a project. While the Music Wall has been decades in the making, it wasn’t until this past fall that the University’s Music Department asked for conceptual drawings in earnest. The Music Wall was to be housed in the department’s choral rehearsal room, a space utilized for both music education and performances. Therefore, the Music Wall needed to serve two purposes. When open, it was to provide roughly 24’ of whiteboard surface for instruction. 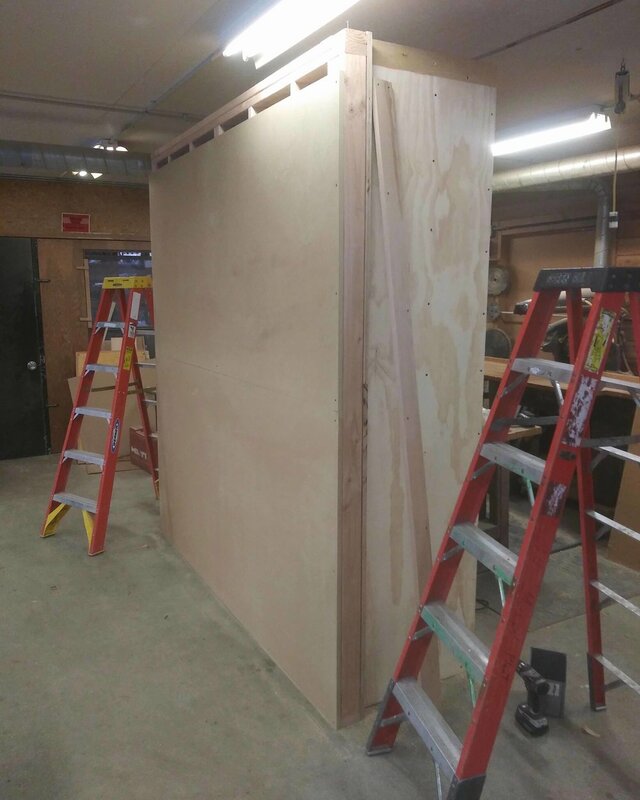 When closed, it was to conceal the whiteboards to create a finished wooden backdrop appropriate for a performance space. So who would build such a structure? Saint John’s Abbey Woodworking or Saint John’s Carpentry? 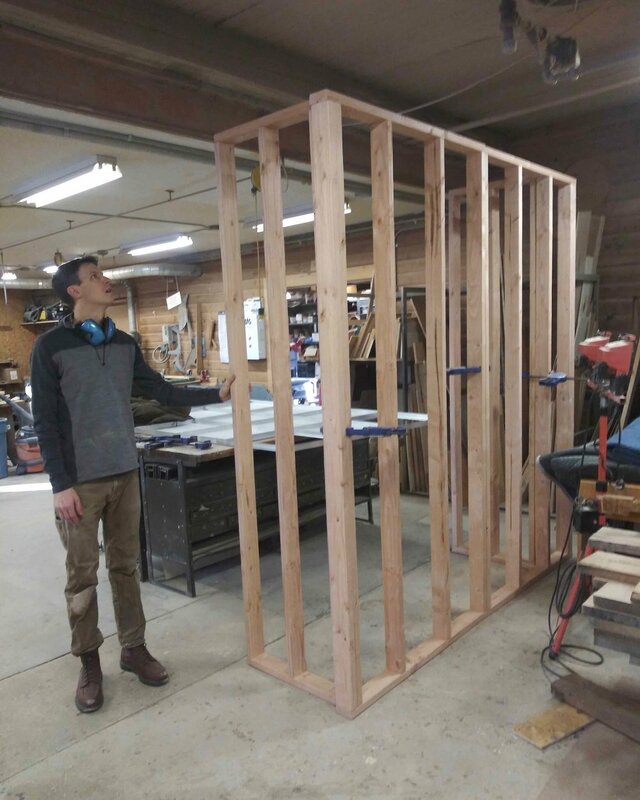 The Music Wall would be a stationary structure, so it needed to have a rigid frame capable of holding two 8’ x 5’ doors. This would seem like a carpenter’s job. Yet, it would need to look like a fine piece of cabinetry as a backdrop for performances, which would seem like a woodworker’s job. So who would craft such a piece? In the end, Abbey Woodworking took on the project, but not without a little guidance from the carpenters. As the Music Wall was far too large to fit through doorways, we needed to essentially build the Music Wall twice. We would initially construct it in the shop, take it apart, oil and finish the exterior pieces, and then reconstruct it on-site -- not the typical way we craft furniture. First, we constructed the wooden frame and clad it with red oak siding to match the existing woodwork in the room. Then we crafted the large 8’ doors that received a dry erase surface on the one side. Due to the size and weight of the doors, supports were fixed to the concrete walls of the Choir Room to support the doors when opened. When closed, the doors would rest on the tray below. Finally, we installed a valence for the pull-down projector screen used to show videos and PowerPoints. As with any custom project, the Music Wall brought its own set of challenges. Luckily, we have a generous and skilled group of carpenters just down the hill to help trouble-shoot any carpentry questions. And likewise, they have a generous and skilled group of woodworkers to help trouble-shoot any woodworking questions they may have. We see it as a symbiotic relationship. You’d have to ask the carpenters to see if they agree.